The Deputy Judge President handed down the court’s judgment. He first disposed of a technical matter that involved the exclusion of DRD Gold in respect of TB claimants. The court dealt with two separate issues: the appealability of the certification judgment and the court’s judgment on transmissibility of damages to the estate of a deceased claimant. 2. It does not finally dispose of any issues. 3. It is not dispositive of any claims. 1. The appeal will unduly delay the litigation. 2. The respondents (the mineworkers) will suffer undue delay should leave to appeal be granted and the appeal not succeed. 3. The respondents will suffer undue and perhaps irreparable prejudice should leave to appal be granted and the appeal not succeed. 4. There is a risk of piecemeal appeals, which is not in the interests of justice. 5. The case is of immense importance for the respondents and is one involving “a socio-economic catastrophe”. 6. The applicants for leave to appal were unable to show any real alternative to the class action. 7. Some putative class members would not be able to access a remedy if certification was refused as they are indigent, unsophisticated and incapable of litigating on their own. While this matter is indeed unprecedented, complex and novel in nature and requires close case management, these factors are not weighty enough that they would tip the scales in favour of granting leave to appeal the certification. There are no real prospects of success. The court went on to say that the class action is not unmanageable and it is not in the interests of justice that leave to appeal be granted. The court granted leave to appeal the parts of the judgment dealing with the transmissibility of general damages to the deceased’s estate. In light of the partial success of the applications for leave to appeal the court’s 13 May judgment, the applicants are jointly and severally liable to pay 50% of the costs of the respondents, including the costs of three counsel. The application for the certification of a class action was heard in October 2015. This resulted in a historic judgment handed down on 13 May 2016, certifying a class action for those who developed silicosis or TB due to exposure to silica dust in the gold mines. The judgment also developed the common law in line with the Bill of Rights to enable the transmission of any general damages to a deceased mineworker’s estate so that the dependents may benefit. 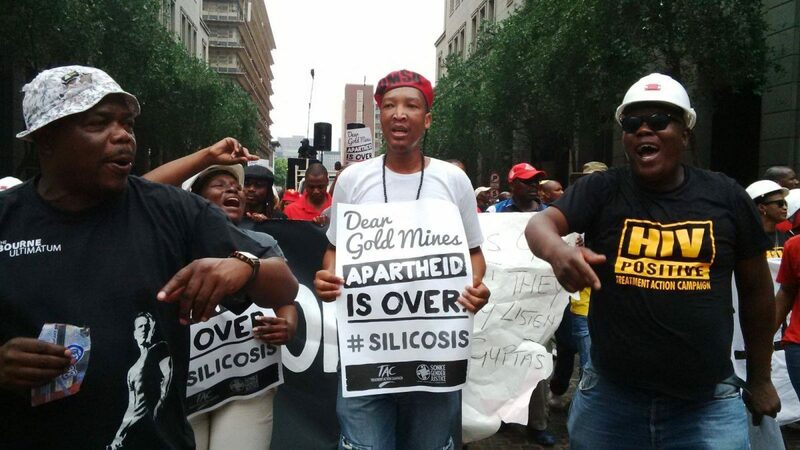 On 23 June 2016, the South Gauteng High Court heard applications for leave to appeal the whole of its judgement brought by the mining companies, including Harmony Gold, Anglo Gold Ashanti, Gold Fields, DRD Gold, Anglo American and African Rainbow Minerals. Harmony started by reiterating the argument that the mineworkers did not show sufficient commonality amongst the plaintiffs and defendants, which is a key requirement for certification of a class action. In other words, the mineworkers did not meet the test for a class action and therefore the court was incorrect to grant the certification of this class. Harmony suggested that a better alternative for the mineworkers would be to bring a test case on one or more issues, which could be brought by individual miners and provide a precedent for similar claims. This, suggested Harmony, would be more appropriate and should have been accepted by the court as a viable alternative and was in the interests of justice to do so. Anglo Gold Ashanti argued that the court’s reliance on the spirit, purport and objects of the Bill of Rights to develop the common law on the transmissibility of personal damages was misplaced. The gold mining companies argued in the certification hearing that the damages were of such a personal nature that they should not be transmitted to their dependents, mostly women and children. Gold Fields suggested that the mere fact that Judge Windell dissented on the breadth of the court’s development of the common law on transmissibility of damages was an indication that the matter should go before the Supreme Court of Appeal to determine the issue. The judges were not too keen on this argument. Gold Fields also suggested that the TB class should not have been certified because the causes of TB are so multifaceted, including smoking, for example. The Deputy Judge President interjected to say that the court was concerned with only one such cause, that is, the conditions in the mines. DRD Gold started by distinguishing itself form the other gold mining companies because it ceased underground mining activities in 2000. It was also earlier excluded from the TB claims. There was some discussion about whether the certification judgment sufficiently distinguished DRD Gold’s situation and potential liability for TB claims. DRD also argued that the court should not have certified a single class that included such diverse conditions as silicosis and TB. However, the judges interjected to say that they certified a single class action made up of two classes. Anglo American reiterated the point that the class action was of unprecedented complexity, novelty and scope. This was an argument made by most of the mining companies in the certification application. Anglo American argued that the court’s discretion is very narrow and the mere fact that another court could have come to a different view is not enough, and that more must be shown. It went on to illustrate the ‘more’. Anglo American also chose to take on the integrity of the court by suggesting that the caution from the court on the conduct of the parties throughout the litigation was in fact a finding that the mining companies were guilty of deliberately obstructing justice. Anglo Gold’s counsel said that the court had vilified the companies and raised a question as to the ability of the companies to have a fair trial. In the exchange with the bench, it was clear that the judges did not accept Anglo American’s characterisation of their judgment. Judge Vally cautioned Anglo American against making such a serious allegation against the court and urged counsel to reconsider. Judge Vally also said that Anglo American had overstepped and was challenging the integrity of the court and that if it intended to do so, it should approach the relevant bodies with its complaint. In reply, the counsel for Anglo American retracted the statement that a fair trial was impossible. The part of the judgment referred to was a statement by the court about the mineworkers complaints that the companies had obstructed their access to justice and that the companies had failed to respond to the complaints. The Deputy Judge President said that such allegations should not go unanswered and that the court would have benefited from the responses. African Rainbow Minerals argued along much the same lines as the other companies. Including, for example, the argument about the complexity and multifaceted nature of the mineworker’s cases and the lack of sufficient commonality. ARM suggested that the court should have taken account of the 8 different alternatives to the class action that were suggested in its papers. ARM suggested that these alternatives might find favour with another court and that leave to appeal should therefore be granted. The Mineworkers, who were the applicants in the main certification case, and respondents in these proceedings, focused on some key issues in their oral submissions. The respondents argued that the certification of the class action was not appealable; that the respondents had shown sufficient commonality to meet the test for the certification of a class action; that the TB class was property certified; and that the court properly exercised its powers in developing the common law with regard to the transmissibility of general damages.